"We strive to provide a safe and fun environment for you and your horse"
In 1992, Neal Simon purchased and completely renovated the property now known as The Western Connection. The goal was to provide a comfortable first class facility for both horse and rider. Recognizing the need for full time, on site professional horse and farm management, Dave and Kris Strain came aboard to complete the team. Dave and Kris Strain, Managers of Western Connection Since its inception, Dave and Kris have called The Western Connection their home. As farm managers, they take great pride in the constant upkeep and maintenance of the facility. As professional horse people, that same sense of pride extends itself to the service and care of each and every horse boarded at Western Connection. Dave is a 3rd generation horseman whose unique exposure began over thirty years ago at his family’s horse sale business. His many talents and horse experience are as diversified as there are number of horse breeds. His sensitive understanding, patience and capacity to bond with horses easily translates in to a successful training program as well as co-managing the entire facility with his wife Kris. Surrounding herself with family, friends and horses has been the recipe for Kris’ happiness. Raising three children on the Western Connection has been a key element in achieving a positive, friendly environment on the farm. Kris’ professional attention to detail in horse care, knowing each horse individually, gives the insight to the needs of each horse at Western Connection. All members of the Western Connection management team and its boarders enjoy	casual summer games sponsored by the farm and in general the non-competitive, relaxed environment at Western Connection. As a longtime community family, Dave and Kris are members of the Horse Council of Granby and along with their children have three times received the Council’s Special Recognition Award for their volunteered service and community efforts. 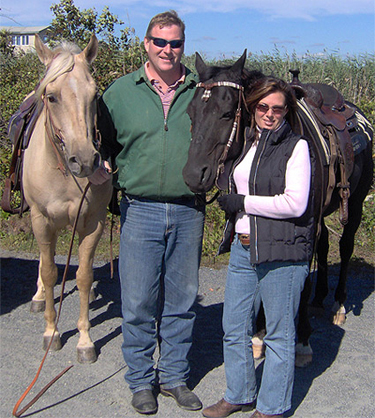 Together, Neal, Dave and Kris’ goal is to provide a safe and fun environment for both you and your horse. "Our ranch offers the best boarding in Connecticut"